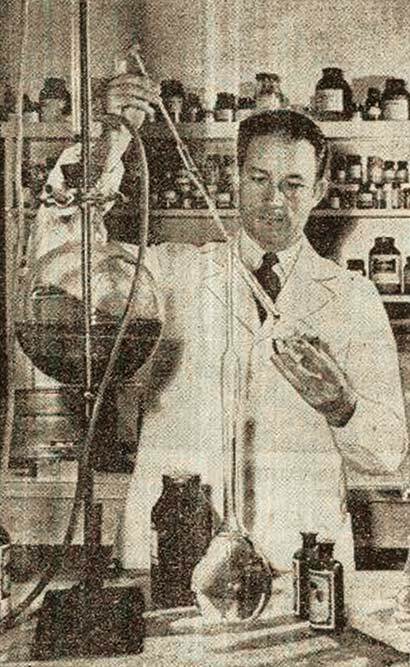 In the early 1950’s Kirsten Hind’s Grandfather, Harry W. Hind, who was a predominant California-based pharmacist, spent time dabbling in the formulation of perfumes as a hobby. One of the successful formulas that came out of his perfume work was Circa 23. Its unique notes reminded him of childhood memories; its name, Circa 23, was given for being perfected after Harry’s 23rd formula attempt. Unique amongst all perfumes, Harry at first only shared the perfume with his close personal friends, many of whom were doctors. The reception and appreciation of the perfume was so great that Harry began producing a small batch of Circa 23 every year, and began providing it as a company gift at Christmas time to his customers. Harry continued with this Christmas Gift tradition for many years, and the desire for Circa 23 grew with each holiday season. Without fail, Harry received hand-written requests every year (dating back to 1963) from his clients requesting to purchase more perfume for their wives. They would run out mid-year and preferred not to wait until the next holiday season. Harry would remind them that the perfume was only available during Christmas time, but assured them they would receive another bottle come Christmas time. When special requests came in from friends of friends who had tried Circa 23, Harry would add individuals who enjoyed and praised it so highly to a personal Circa list so they could be assured of receiving Circa 23. Along with the desire of Circa 23 from Harry’s clients came several offers from perfume manufacturers to purchase the formula. Harry refused these offers as it was more important at that time for him to keep Circa 23 exclusively for his good friends, family and customers. Someday, Harry explained, he would consider bringing Circa 23 to market if there was the opportunity to offer multiple products. When Harry stopped producing Circa 23 as a hobby, he safely stored the ingredient list, manufacturing process, and customer letters. It was years later that he shared this formula with his son, Greg, and granddaughter, Kirsten, who fell in love with the family tradition and the scent. They felt passionate about reproducing the scent and sharing the special perfume and its history with others. Helen Miesse is the inspiration for Circa 23 parfum. Recently Harry's son, Greg, embarked on the project to produce the parfum after receiving the original formula from Harry. Greg and his daughter, Kirsten, brought Circa 23 parfum to the market in 2012. Circa Company continues as a symbol of love, history and tribute for the Hind Family.